This thing. It's supposedly the Floating Health bar from Sakiisa's hud. ninjajiroCould someone tell me why this text appears in a corner when I'm spectating people while dead? P.S. did anyone manage to make the itempanel in the freezepanel stay in one place? Mine just randomly appears where it wants to. Also, how do I fix this so the image is not as large? Anybody able to move the itempanel? [quote=ninjajiro]Could someone tell me why [url=http://imgur.com/he62jyW]this text[/url] appears in a corner when I'm spectating people while dead? Also, how do I fix [url=http://imgur.com/BxrQa0N]this[/url] so the image is not as large? Where can I edit the white background and border parts? For some reason as soon as I changed these buttons, they won't actually open their loadouts. Anyone know why? _Kermit Azazel Dan_xpos_minmode and ypos_minmode are for changing the position in minmode. Text Alignment is the same for the Ammo In Clip + Shadow and Health + Shadow, all "West". So I have an edited version of bwhud and at one point I must have messed up the html window that comes up in game (like when you check logs/sizzling stats in game). I cannot close it. Clicking continue doesn't do anything. Any help? For some reason my medic ubercharge number shows up a percentage sign after the number. I installed fonts and hud correctly that i am pretty sure, but it still shows up like this. How do I edit these things circled in the picture? How do I edit [url=http://imgur.com/dJVSmxy]these things [/url]circled in the picture? As for mainmenu, it's mainmenuoverride.res and gamemenu.res. You'll probably also need to copy color definitions and fonts from clientscheme.res. Class-selection is classselection.res. [quote=deetr]I want to copy the main menu and class selection screen from another hud into my current hud, what files do I need to overwrite? Also what do I need to copy to keep my current in-menu keybinds working (eg q to back out of a menu instead of 0 and r to random pick a class)[/quote] As for mainmenu, it's mainmenuoverride.res and gamemenu.res. You'll probably also need to copy color definitions and fonts from clientscheme.res. Class-selection is classselection.res. Bit3rFor some reason my medic ubercharge number shows up a percentage sign after the number. That's how it is by default, the % coming after the actual value. To hide it, just mess with the width of resource/ui/hudmediccharge.res or the width of the hudmediccharge entry in scripts/hudlayout.res so it only shows numbers, if that's what you want. ninjajiroHow do I edit these things circled in the picture? ItemModelPanelCollectionItem.res - Same as ItemModelPanel, but for skinned weapons. The main menu is resource/ui/mainmenuoverride.res, class slection is classselection.res, team select is teammenu.res. RawrsorFor some reason as soon as I changed these buttons, they won't actually open their loadouts. Anyone know why? You need to make sure ControlName is ImageButton and Command is "loadout soldier" and the other classes. [quote=Bit3r]For some reason my medic ubercharge number shows up a percentage sign after the number. That's how it is by default, the % coming after the actual value. To hide it, just mess with the [url=https://github.com/MFSTATE/tf2basehud/blob/master/resource/ui/hudmediccharge.res#L20]width of resource/ui/hudmediccharge.res[/url] or [url=https://github.com/MFSTATE/tf2basehud/blob/master/scripts/hudlayout.res#L74]the width of the hudmediccharge entry in scripts/hudlayout.res[/url] so it only shows numbers, if that's what you want. [quote=ninjajiro]How do I edit [url=http://imgur.com/dJVSmxy]these things [/url]circled in the picture? 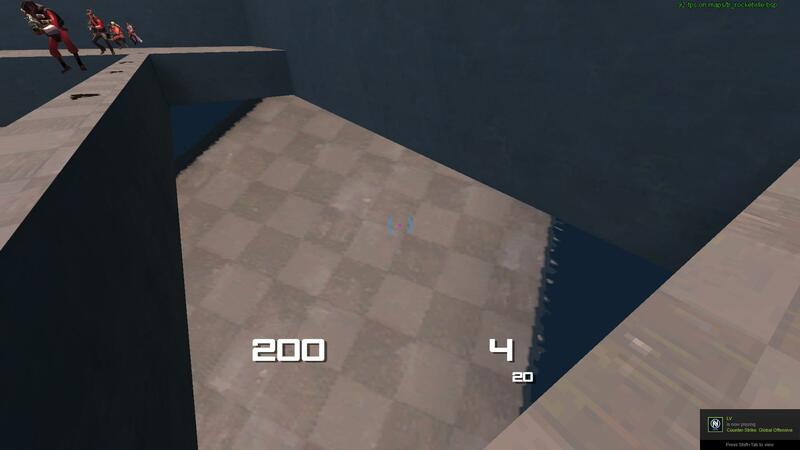 [*] [url=https://github.com/MFSTATE/tf2basehud/blob/master/resource/ui/econ/itemmodelpanelcollectionitem.res]ItemModelPanelCollectionItem.res[/url] - Same as ItemModelPanel, but for skinned weapons. [quote=Rawrsor]For some reason as soon as I changed these buttons, they won't actually open their loadouts. Anyone know why? The widths of the items' "boxes" or whatever in hudlayout.res are all "f0". My resolution is 1680 x 1050. How do I stop all the numbers from cutting off? If it's a problem with weapons that don't have a clip (ones you don't reload, like flamethrowers and miniguns) mess with AmmoNoClip's width and xpos too. Messing with the width/x-pos just moves the cut off numbers to the right/left. 1. How do i get rid of this? 2. In what file can i change the position of the Ammo Numbers? Smesi1. How do i get rid of this? 2. resource/ui/hudammoweapons - Change the x and y values of "AmmoInReserve"
[quote=Smesi]1. How do i get rid of this? 2. It worked,but with guns with more than 9 things in the clip,the clip number goes over the Reserve number. 1. My bad, it's actually at the top of hudplayerclass.res, in "HudPlayerClass" change "enabled" and "visible" to 0. 2. Just play around with the AmmoInReserve X values until you get something that works for you. Keep using hud_reloadscheme instead of restarting your game to save time. 1. Set enabled and visible to 0 for PlayerStatusClassImage, PlayerStatusSpyImage and PlayerStatusSpyOutlineImage to remove the 2D player image (or xpos 9999 if that doesn't work). 2. I'm guessing the textAlignment for AmmoInReserve is east? Change it to west and adjust the xpos accordingly. EDIT: Jerm beat me to it. Not a hud thing but there isn't a cvar/script thread, and you guys usually know stuff. does anyone know how to make the background color of the scoreboard on broeselhud blue darker? If your Trade Ups don't work: update your hudanimations_tf.txt to contain the bottom part of the default hud file with regards to the contract stuff! 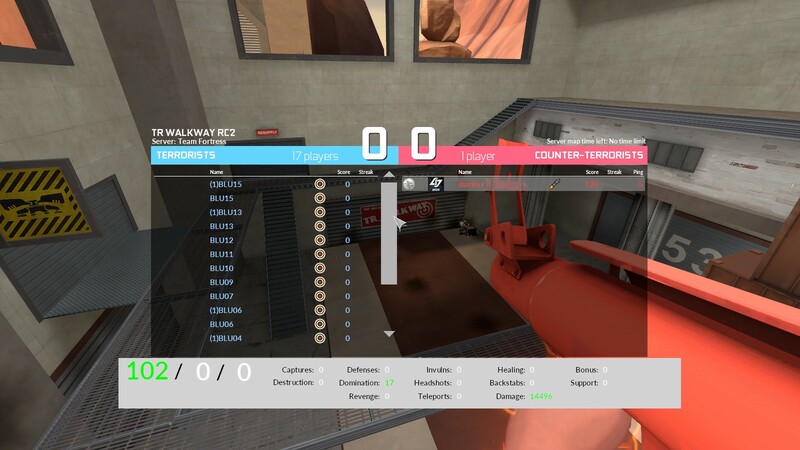 If your Trade Ups don't work: update your [b]hudanimations_tf.txt[/b] to contain the bottom part of the default hud file with regards to the contract stuff! WiethoofdIf your Trade Ups don't work: update your hudanimations_tf.txt to contain the bottom part of the default hud file with regards to the contract stuff! the freezepanel itempanel doesn't consistently expand from bottom to top like the other itempanels (hudinspectpanel, spectator, spectatortournament). sorry if this has been asked before-- how do I remove the lime green from the scoreboard numbers? also what's the setting to make imagepanels rounded? [s]sorry if this has been asked before-- how do I remove the lime green from the scoreboard numbers?